The highly-trained technicians at the Lannan Chevrolet car collision center are here to service any make or model vehicle for our customers in Billerica, Tewksbury and Dracut. Our body shop is committed to providing excellence in all areas of customer service, including superior collision repairs. To that end, our professional staff is devoted to making your repair experience as enjoyable and efficient as possible. Our dealership boasts state-of-the-art facilities that feature the latest technology available, allowing our experienced technicians to make sure your vehicle is getting the best treatment possible.Our body shop also has established preferred service arrangements with local towing and rental facilities, which means that if your vehicle is not safe to operate after your collision, we can arrange for it to be towed to our facility. We even have a rental agency on-site for added convenience, so the collision center team will be able to coordinate substitute transportation at your request to help get you back on the road in Andover and Chelmsford in no time!To ensure that our customers are fully covered for repairs, we have worked hard to build positive relationships with virtually all auto insurance companies. Because of that, we are able to offer direct repair, door-to-door and platinum auto service programs depending on which company you are insured by. 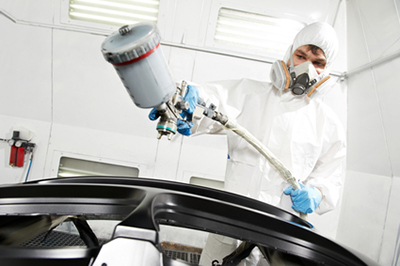 Our staff is happy to work with your insurance company to guarantee the highest-quality collision repair. If your new or used car, truck or SUV needs a repair, Lannan Chevrolet is ready to take care of you. Visit the collision center at our Chevy dealer near Lawrence for service, or schedule an appointment with our dedicated team online today!